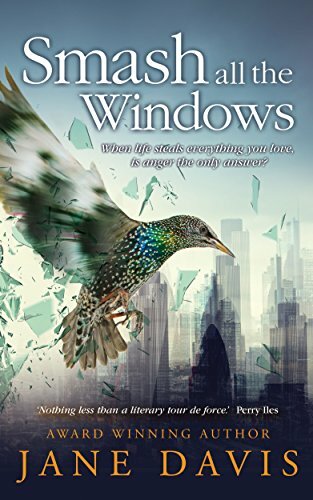 Jane Davis is one of those authors whose books all have an entirely different feeling to each other, Smash All The Windows being another example of what ties them all together, the brilliant depiction of the characters, whatever their age, circumstance or time period. The centre of this book is a tragedy of the type fortunately most of us will only ever read about or watch in horror on news reports. Fifteen years ago at a fictional tube station St Botolph and Old Billingsgate, a crush occurs. It starts on an escalator and fifty-eight people lost their lives. Their loved ones have gone through an inquest and a class action before the most recent, second inquest which rules that the victims weren’t at fault. The reader learns about some of the victims through their relatives who have never given up trying to ensure that a similar incident never occurs again. My thoughts of the book instantly conjured up one I read in 2011, The Report by Jessica Frances Kane about the Bethnal Green disaster of 1943 where a crush on the entrance to the station resulted in a large loss of life of those seeking shelter from air raids. I’m sure you can pick your own reference, something the author herself addresses during the novel. What makes this book different is the wide range of fictional characters who are altered by the tragedy, from the parents, siblings and partners of those who lost their lives to the trainee lawyer who immerses himself in the points of law. All of these people are bought to life and while I won’t deny this book is terribly sad overall there is some hope, even if all that hope consists of is that those people manage to get some relief from the day that changed their lives. The story is told from different viewpoints we see Gina a mother whose marriage has fallen apart, her daughter just a teenager at the time of the tragedy having lost her childhood as she tries to support her mother. The secrets that they keep from one another trying to help or avoiding difficult subjects, we see it all from both sides. Whatever anyone says, people don’t turn into saints because they’ve suffered and life can continue to be unfair. Another woman becomes a keyboard warrior having been unable to leave her house. Some of the families blamed those on duty, but what if they were victims too? How does that work. The past and the present run alongside each other, memories throwing us back in time to re-examine facts, and a special project creating a sense of community with those who never wanted to be members of this select group. I saw Jane Davis’s work as a project, almost as mammoth as Eric’s research into the fictional tragedy and the art project that Jules undertakes. This is an ambitious piece of writing and I’m delighted to say one that works. I can’t leave this review without alluding to the metafiction tag which gave rise to a number of questions when I featured the synopsis earlier on the blog. I’m going to be honest, I’m not quite sure what it means in the context of this story, and to be honest, I don’t really care. Smash All The Windows was an immensely compelling read, told in the first person I felt the various character’s emotions, I cared about them all. Somehow whilst revolving around the tragedy this is a book to make you think, from the mundane to the more philosophical questions, yet all the while remembering that the readers want to connect to the book and its unique set of characters. I know I was urging them forward all the way. I would like to say a huge thank you to Jane Davis for allowing me to read a copy of Smash All The Windows prior to publication, today, 12 April 2018. This unbiased review is my thanks for an exceptional and engaging read. This sounds so good Cleo, I do like a good multiple narrative. Glad to hear that you enjoyed this one Cleo. I have a copy for review also. FYI, the term ‘metafiction’ has puzzled me as well. I’ve seen it used for several different types of writing. Oh, this does sound compelling, Cleo. When it’s done well, the multiple-viewpoint strategy can be really effective, especially for something like this. And I’m one who really does enjoy strong character development. I’m very glad you enjoyed this. I like the imagery suggested by the cover and the bird. Interesting review. I’ll keep this one in mind. Definitely different from my usual and that’s turning out to be a good thing. Thank you for the review. New author new book for me. Very tempting! Thanks for sharing…and happy reading! I added The Report to my TBR back in 2013, (possibly when you reviewed it? ), and tragically it’s still languishing on my Kindle. Rather than adding another, I shall go and see if I can find a way to bump it up the priority list. This also reminds me of Let the Great World Spin by Colum McCann – although it wasn’t directly about a tragedy, it was about a group of people whose lives were all touched in one way or another by a man tightrope-walking between the Twin Towers in 1974, and obviously was a take on the future 9/11. As someone who spends every weekday in a massively overcrowded tube, this sounds scarily close to home. Something has to change – the whole London transport network isn’t fit to carry the vast numbers that use it now. Maybe one to read when I’ve got a week off work! Definitely one you’ll appreciate then and yes, probably best not to read on the commute although you may not want to return.